Knowing you have a support system, should you need it, is vital in today’s uncertain landscape of political unrest, health scares, and natural disasters. A good TMC will provide adequate risk assessment of all traveler destinations so the traveler is well-prepared before their trip. A global network of support that is available at all hours, all year round is a necessity so that travelers can travel safe and travel smart. Having open lines of communication with a global account management team is essential to long-term success. Every travel program is unique and providing support for a customized program that is sensitive to cultures, objectives, and organizational structure is vital being able to set and achieve long-term goals. The top priority for any TMC should be providing excellent customer service. Being personal, adaptable and thorough are all essential qualities that should be provided regardless of travel program size or structure. An integrated, multi-modal approach to business travel combined with pre and post trip reporting and expense management is essential in the design of efficient travel programs. TMCs deploy a range of technologies to help deliver the most appropriate solutions for your customized travel program. Choosing a TMC that pays attention to the quality you receive will pay dividends when it comes to speedy dissemination of vital information. Productivity of your travel program can be increased by a well-organized TMC. Travel experts will negotiate and manage the best rates that are customized to your travel program. No two programs are the same so it’s important to employ a TMC that recognizes these subtle differences to maximize your benefits. 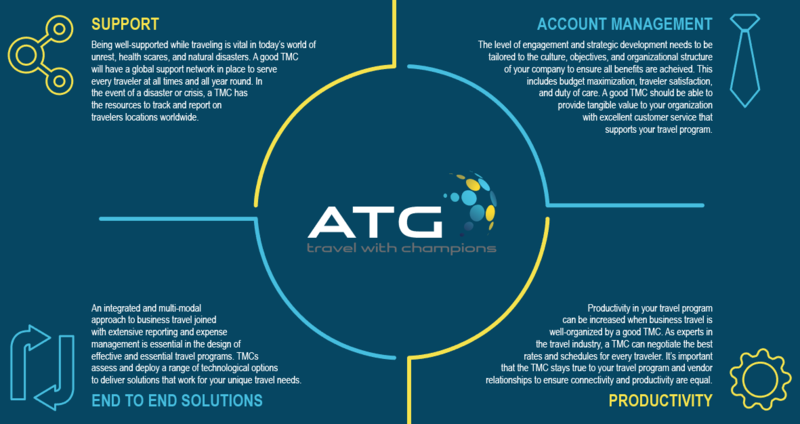 If your TMC isn’t meeting these areas of service, maybe it’s time to experience the ATG difference and what ATG can do for your program.